Think of kids’ parties and you automatically think of sugar. 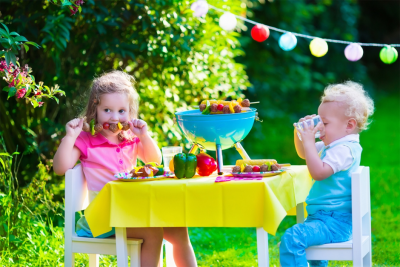 Cake, sweets, fizzy drink… it can often be a time when youngsters are overloaded with unhealthy treats. But it’s unnecessary - since it’s impossibly easy to have a special, colourful and exciting celebration without the sugary foods and saturated fats. And then there’s the question of party games - how will you possibly keep them occupied for hours? Luckily for you, we’ve rounded up the best recipes and games to host a guilt-free, mega healthy jamboree - and all without the fuss. Follow our party tips and start making magic memories - without the mountain of icing. Every party needs sandwiches. But instead of reaching for those quick-fix fillers, go with fresh ingredients such as tuna, avocado, tomato, and hummus. 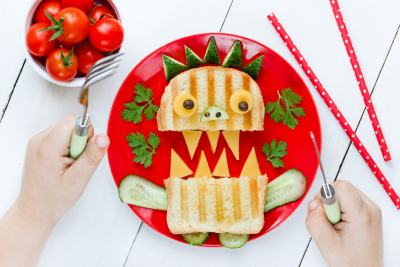 Make them more appealing to kids by cutting them into funky shapes like hearts or stars - or even a monster! For a sweet treat, melt chocolate (the darker the better) and dunk into peeled banana, then roll in nuts, seeds, or berries for a colourful popsicle without the additives. You can also use nature’s own colours to jazz up homemade cakes: try juiced beetroot, spinach, oranges, or blueberries to add some pretty shades to desserts. If your kids and their friends are fizzy drink monsters, there’s plenty of alternatives. One of the best ways is to blitz up your own homemade lemonade (use honey, agave syrup or maple syrup to avoid sugar), or juicing up fruit and veg in big batches. With colourful juices, you can give them names relating to kids’ favourite Disney characters or animals. •Musical bumps. The children dance around to music; then have to sit down as fast as possible when the music cuts. The last one to sit is out of the game and the last kid dancing is the winner. •Follow my leader. Choose someone to take lead (having an adult to begin can help get things started) and have the children copy whatever the leader does as they move around the room or garden. This could be silly walking, being an animal, jumping, running, skipping, star jumps; or whatever else you think up. Every parent wants to celebrate the birth of their son or daughter to the maximum - but that doesn’t mean you need to order a full-on magic troupe to bend balloons into unicorns. Often the best parties are the ones that are kept traditional: we’re talking old school party games and treats with minimal ingredients. They’ll love it, you’ll love it, and your bodies’ will thank you for it.